This page offers general information on advanced bioenergy in Europe, with links to more detailed information on the ETIP Bioenergy website and other information sources. Which advanced bioenergy products are there and how much is consumed? What are the benefits of advanced bioenergy? Which different types of advanced bioenergy are there? Which feedstocks are used for advanced bioenergy in Europe? How is ETIP Bioenergy supporting the commercialization of advanced bioenergy? Advanced bioenergy is produced from lignocellulosic feedstocks (i.e. agricultural and forestry residues, e.g. wheat straw/corn stover/bagasse, wood based biomass), non-food crops (i.e. grasses, miscanthus, algae), or industrial waste and residue streams, has low CO2 emission or high GHG reduction, and reaches zero or low ILUC impact. Advanced renewable transport fuels include advanced biofuels (see RED-II definition 34), recycled carbon fuels (35) and renewable liquid and gaseous transport fuels of non-biological origin (36). Of these, advanced biofuels are the most important. Intermediate bioenergy carriers for electricity, heating and cooling include pretreated biomass, such as torrefied pellets, or bio-oil. The term advanced bioenergy is usually used for advanced renewable transport fuels and for intermediate bioenergy carriers for electricity, heating and cooling. Two different markets are supported by advanced bioenergy products: on the one hand the transport market (biofuels, 33) and on the other hand the EHC (electricity, heating and cooling) market (bioliquids, 32). The products of advanced bioenergy are divided in products for the transport market and in products for the EHC market. According to the EurObserv’ER the primary bioenergy consumption of the EU28 in 2017 increased to 99.8 Mtoe (i.e. 1,160.67 TWh) and the biofuels consumption reached 15.5 Mtoe (i.e. 180.27TWh). With respect to advanced bioenergy consumption, we are not aware of any database or status report for the use of advanced bioenergy for electricity, heating and cooling production. Data for advanced biofuels for the transport sector is available as described below. In its report “Status of Advanced Biofuels Demonstration Facilities in 2012”, IEA Bioenergy Task 39 lists 71 advanced biofuels production facilities worldwide, with a cumulative production capacity of 2,530,000 tons per year in 2012. Of all technologies for the production of advanced biofuels, hydrotreatment of vegetable oils has developed most rapidly and has contributed 2,190,000 tons per year to the worldwide biofuels production (representing ~2,4 % of the total worldwide biofuels production). Information on European projects is available in the production facilities section of the ETIP Bioenergy website. Worldwide mapping is done by IEA Bioenergy Task 39 in its online database on advanced biofuels production facilities. In 2011, the Advanced Biofuels Tracking Database listed 130 advanced biofuels production facilities, with a combined annual production capacity of ~700 million gallons in 2011, the largest part of which is HVO (572 million gallons in 2011). The target of RED-II for advanced biofuels is to provide 3.5% of transport energy by 2030, multiple counting included. Advanced bioenergy, has the potential to create thousands of new jobs, stimulate rural development and generate wealth within the growing European bioeconomy. Advanced bioenergy contributes significantly to energy security, reduces GHG emissions and provides a long-term sustainable alternative to fossil fuels in Europe. Being the only near-term alternative to fossils for some applications, like marine (shipping) or aviation, advanced bioenergy has the potential to significantly contribute to GHG emission reduction in these sectors. Furthermore advanced bioenergy is compatible with existing infrastructure and advanced biofuels do not, due to the used feedstock, lead to food vs fuel debates. A further description of the benefits of specific advanced biofuels can be found e.g. in the “Survey on Advanced Fuels for Advanced Engines”, publishes by IEA Bioenergy Task 39 and AMF TCP. 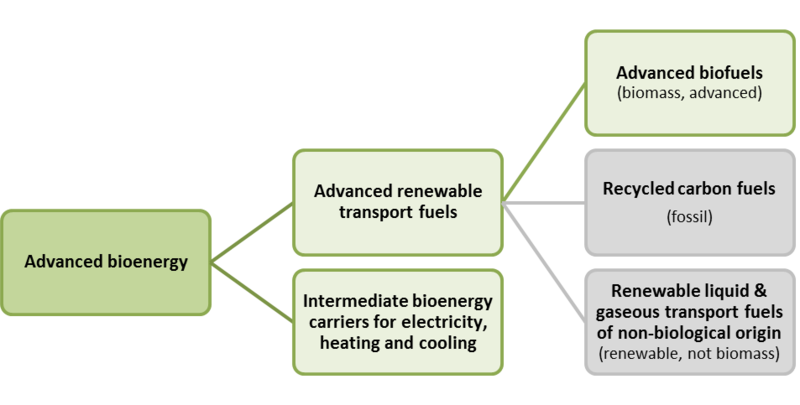 Some of the main types of advanced bioenergy being developed and deployed in Europe and globally are described in the following section. Bio-oil/Bio-crude can be produced by pyrolysis, hydrothermal liquefaction and by hydrogenolytic de-polymerization of lignin. Bio-oil can be used as a heating fuel or can be further converted to advanced biofuels. Torrefied pellets (biomass) heating at 200-300°C in the absence of oxygen, at atmospheric pressure, converts biomass to "bio-coal", which can be more easily used for power generation than untreated biomass. Hydrotreated Vegetable Oils (HVO) / Hydroprocessed Esters and Fatty Acids (HEFA) do not have the detrimental effects of ester-type biodiesel fuels, such as increased NOx emission, deposit formation, storage stability problems, more rapid aging of engine oil or poor cold properties. HVOs are straight-chain paraffinic hydrocarbons that are free of aromatics, oxygen and sulfur and have high cetane numbers. They are also approved for use as aviation fuels. The aim is to produce HVOs from sustainable feedstocks. Cellulosic ethanol can be produced by hydrolysis and fermentation of lignocellulosic agricultural wastes such as straw or corn stover or from energy grasses or other energy crops. The end product is the same as conventional bioethanol, which is typically blended with gasoline. BioSynthetic Natural Gas (BioSNG) is produced via an initial gasification step followed by gas conditioning, SNG synthesis and gas upgrading. BioSNG can be used in a similar way to biomethane (biogas) generated via anaerobic digestion (a biological process). Syngas may also be converted to liquid fuels. FT-liquids / Biomass to Liquid (BtL) is generally produced via gasification (heating in partial presence of oxygen to produce carbon monoxide and hydrogen). Feedstocks include woody residues or wastes or energy crops. Gasification is followed by conditioning and then fuel synthesis via Fischer-Tropsch or the "methanol-to-gasoline" process. BtL is used in diesel engines. It has also been approved as an aviation fuel. High temperature plasma gasification can be used to convert a wider range of feedstocks to syngas, which can then be cleaned and converted into fuels. Methanol is currently most produced by the catalytic conversion of syngas (a mix of carbon monoxide, carbon dioxide and hydrogen) from fossil sources. Biomethanol can be produced from a wide range of biomass feedstocks via a thermochemical route similar to the Fischer-Tropsch process for BtL. It can be blended in petrol at 10-20%. BioDME (dimethylether) can be produced via catalytic dehydration of methanol or directly from syngas. Above -25°C or below 5 bar DME is a gas. Hence its use as a transport fuel can be considered similar to that of LPG. Biobutanol is an alcohol that can be used as a transport fuel. Each molecule contains four carbon atoms rather than two as in ethanol. It is more compatible with existing fuel infrastructures and engines than ethanol. Novel fermentation techniques are being developed to convert sugars into butanol using modified yeast strains. Synthetic paraffinic fuel / Hydrocarbons via chemical catalysis of plant sugars Chemical catalysis or modified microorganisms offer great potential for converting sugars into specific fuel molecules including biopetroleum, bio jet fuel and other drop-in fuels, which have very similar properties to their fossil fuel counterparts. Drop-in biofuels via biotechnology, synthetic biology, modified metabolism and other techniques are being developed to convert plant sugars to a range of fuels that have similar properties to fossil gasoline or diesel. Biohydrogen Hydrogen can potentially be produced from biomass via various routes and can be used as a vehicle fuel. Biohydrogen is not currently being produced at significant volumes, but could be an important fuel in the future. Algal biofuels may be produced from macro algae (seaweeds) and microalgae via a range of technologies. A number of projects and pilot plants are now identifying the best types of algae to use and the best production technologies. Various advanced biofuels can be produced with algae as feedstock, but economics call for higher-value products, such as cosmetics, pigments, food supplements and additives etc. Algal biofuels have attracted great interest as they do not compete with food crops for land use, but the technology is not yet as mature as that for some other advanced biofuels. In general, advanced bioenergy is produced from cellulosic and lignocellulosic materials, such as agricultural and forestry residues, wastes, energy crops, or aquatic biomass. The aim is to develop energy crops that result in the production of more fuel per unit of land used and require less chemical and energy input for production and harvesting. This results in a higher yield in terms of net GJ energy produced per hectare land used. Preferably, energy crops are grown on marginal land that does not compete directly with (or displace) land used for food crops. (q) Other ligno-cellulosic material except saw logs and veneer logs. Yes, if done in the right way. The positive effect on GHG emissions reduction can be calculated by a Life Cycle Assessment (LCA), for any specific pathway, taking into account the cultivation, harvest, transport and conversion. Generally such assessments show that advanced bioenergy offers great reduction of GHG emissions compared to conventional bioenergy (and the more when compared to fossil fuel or energy). However, there is competition for land and feedstock between advanced biofuels, use for heat and power generation through combustion, and material use. There is a debate about indirect Land Use Change (iLUC), which is covered in greater detail on the sustainability page of the ETIP website. How is ETIP Bioenergy supporting the commercialisation of advanced bioenergy? The European Technology and Innovation Platform (ETIP) Bioenergy brings together stakeholders from academia, industry and civil society involved in the development of research and innovation strategies for energy technologies, who interact with relevant public authorities of the EU Member States as well as the European Commission. The ETIP Bioenergy combines the efforts of the European Biofuels Technology Platform (EBTP), which started in 2006, and the European Industrial Bioenergy Initiative (EIBI), which commenced in 2010. The aim, defined in the Terms of References, is to come to a coordinated, coherent and efficient implementation of the objectives of the Energy Union including the 2030 Framework scenario and the 2050 Roadmap for a secure, affordable, competitive and efficient energy system. The mission of ETIP Bioenergy is to contribute to the development of cost-competitive, innovative world-class bioenergy, biofuels and other renewable liquid and gaseous fuel value chains including renewable electrofuels, to the creation and strengthening of a healthy European bioenergy industry and to accelerate the sustainable deployment of bioenergy and renewable fuels in the European Union through a process of guidance , prioritization and promotion of research, technological development and demonstration. A wide range of Horizon2020 projects made a significant contribution to the development of advanced biofuels technology in Europe. Links and details are included on the research funding page of the ETIP website. The future EU research and innovation programme "Horizon Europe - the Framework Programme for Research and Innovation" covers funding from 2021 – 2027.